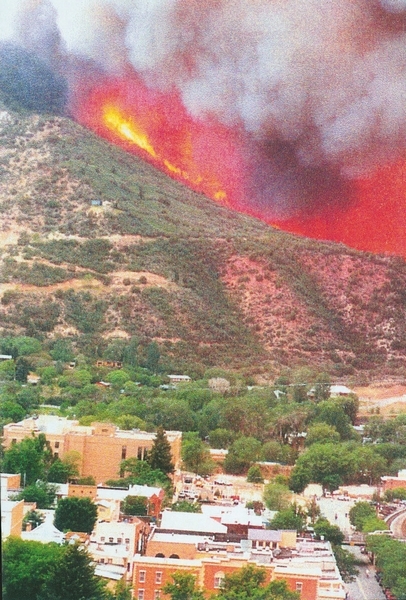 GLENWOOD SPRINGS, Colorado – Ten years ago today, a wildfire sparked by a burning underground coal seam and pushed by hot, dry gusting winds blew up into a roaring conflagration of epic size that swept through West Glenwood. The Coal Seam Fire burned 29 homes and more than 12,000 acres of land. Thousands of residents in West Glenwood and Four Mile were evacuated for days. Firefighters were camped at Two Rivers Park for weeks fighting the blaze as it lurched northward on the Flat Tops. Remarkably, no one was killed or seriously injured, a point of pride for fire officials who had absorbed the painful lessons of the Storm King Fire eight years earlier, which killed 14 federal firefighters. In August 2002, the burnt slopes gave way under heavy thunderstorms to send devastating mudslides down into Mitchell Creek and onto I-70. Today, officials are marking the anniversary by issuing a strict regional fire ban covering private and public lands. With fire conditions this year as severe as those of 2002, there is widespread fear that an errant spark on a windy “red flag” day will lead to another disastrous wildfire. “Today, the conditions are just as bad as they were then,” said Bill Kight, public information officer for the White River National Forest. He spoke from Eagle on Thursday, buffeted by high winds on yet another of this season’s red flag warning days. “We would just beg and urge people to keep the risk foremost in their thoughts when they are out doing things, and to be very cautious,” said Glenwood Springs Police Chief Terry Wilson. Kight, Wilson and many others in the community have vivid memories of June 8, 2002, when the fire roared into town, and of the days and weeks after when the community came together to aid those who had lost their homes, who were displaced in the evacuation, and who were on the front lines fighting the fire. For Michel Field and her then-fiance, Troy Gordon, the Coal Seam Fire was a direct hit. Their home on Highway 6 in West Glenwood burnt to the ground, as did the nearby home of Gordon’s mother and stepfather, Janice and Jim George. Gordon was out of town, and Field was talking to him on the phone from the east deck of the house. She’d already taken a drive up South Canyon that morning to see the little brush fire that erupted south of the landfill. By the late afternoon, however, the smoke was getting thick. Her mother-in-law came by to tell her about the closure of I-70 west of Glenwood Springs. While they were talking, a neighbor pounded on the door. “When we opened the door, my one neighbor’s house was on fire,” Field recalled. She grabbed her pocketbook, her cell phone and the house key and shooed her dogs out of the house. They had to run toward the fire to get to the car, but they evacuated safely. Her mother-in-law ran home to flee with her husband and their pets. “By time they drove out, flames were hitting their car,” Field said. A decade later, Field is well over the pain. She and Gordon married that fall, built a new home in the same location, and they now have a 5-year-old son. “You don’t have to wallow in it,” Field said. “It’s hard in that moment. I am not a crier, but I sure cried, for several days. But Troy and I, out of all the people that lost their homes, we lost the least. We didn’t yet have wedding photos or kid photos, and we didn’t lose our pets. “Everyone else lost photos, or they lost pets. We lost stuff.” she said. Field said she has felt safe living in the same location, although she is very fire-safe and she always has her grab-box ready, especially in a dry year like this one. “It happened, it was horrible, but you just move on and really hope it doesn’t happen again,” she added. Don Vanderhoof, who has lived in Glenwood Springs since he was a teenager, was the city’s mayor in 2002. The city government had just invested millions of dollars building the community center at the east end of the Meadows and the municipal operations center at the west end. There was no shopping center in between, just an open field of grass below the beautiful backdrop of Red Mountain and an apron of oakbrush. Vanderhoof was at his son and daughter-in-law’s home in West Glenwood that Saturday afternoon. “I got the call that we were in deep trouble. There was no sign of fire then, but it took 40 minutes to get from there to City Hall because word had gotten out and the city was in complete gridlock,” he said. “I remember watching from Donegan Road as the fire came across what was then Wulfsohn Ranch, and it was just an absolutely horrible feeling. I thought we’d lost everything we just built over there, and I couldn’t do anything,” he recalled. City officials convened at City Hall, planning for widespread evacuations of entire areas of the city, not knowing which way the fire would turn. “Fire trucks started to show up from across the state, which really gave you a good feeling,” Vanderhoof said. But he clearly remembers standing at Eighth and Cooper, watching flames reach the top of the ridge above the Red Mountain neighborhood and the city’s water treatment plant. Gary Tillotson, acting chief of the Glenwood Springs and Rural Fire District, was a fire captain at the time. He and a crew of city firefighters tried to face down the wildfire in the Storm King Mobile Home Park, but had to retreat. “The fire came into town like a freight train. It jumped the Colorado River and I-70 in a matter of minutes,” he said. Earlier in the afternoon, the fire department had set up a command post at the West Glenwood fire station on Mel Ray Road, working up an evacuation plan for South Canyon, upper Mitchell Creek and the Ami’s Acres campground. “Then the fire moved into town much more quickly than we were able to get people out. 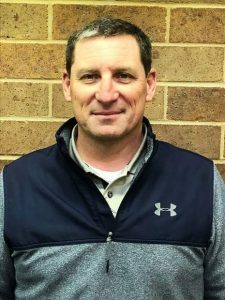 When it blew into West Glenwood, we took all our fire apparatus and went to key locations out there and tried to protect structures,” Tillotson said. Tillotson was on deck as a firefighter in 1994 when the Storm King Fire happened. But as a wildfire burning on mostly federal land, he was on the sidelines. Coal Seam was different, and at first the city firefighters tried to battle it like they would a more typical urban fire. “When you’ve got a fire in a residential area with fire hydrants and things, you can be a lot more aggressive than when you are out in the wildland. So the tactics become much different,” he said. But the Coal Seam Fire was burning and moving forward at a magnitude that shocked everyone. 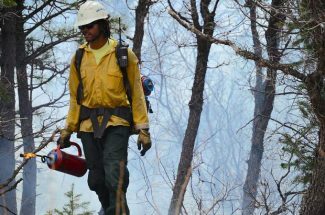 With the experiences of the Storm King Fire seared in their minds, firefighters opted for lines they could realistically defend. “We had no casualties, and it’s a credit to all of our responding folks that we did operate with safety for the public and ourselves in mind. We were very safety conscious. We did learn some lessons from Storm King,” he said. Glenwood Springs Police Chief Terry Wilson was right in the middle of it, directing police officers scrambling to evacuate neighborhoods, sorting out rumor and fact, interacting with other agencies and planning for worst-case scenarios. “Controlled chaos and panic is about the best way to describe that day,” he said. As the fire was barreling east through South Canyon, Wilson was standing in West Glenwood in a cloud of smoke, trying to organize emergency teams headed up Mitchell Creek and residents fleeing down. Two police officers driving up Mitchell Creek described over the police radio that the fire was jumping the road and burning above their squad cars. Authorities retreated to city hall downtown as West Glenwood was evacuated. With thick smoke filling the valley, there was no way to tell what was happening in the areas being burned over. 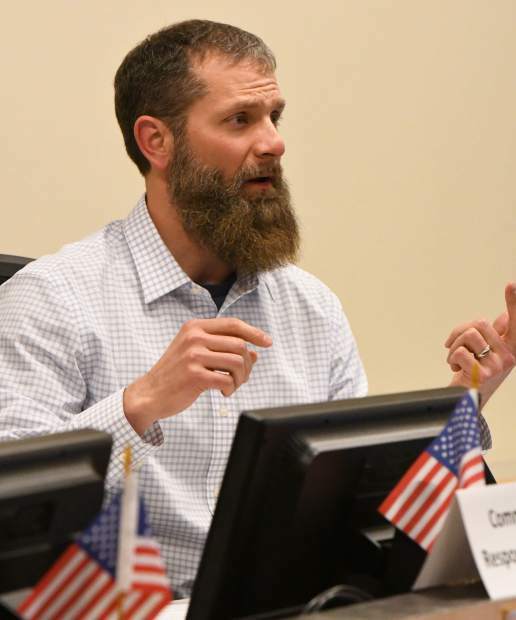 Wilson recalled all sorts of rumors going around that the Glenwood Springs Mall and the nearby auto dealerships were on fire, and that the community center and the municipal operations center had burned down. There were also fears that the fire would burn up through South Canyon and head east into the upper Three Mile and Four Mile areas. An officer new to the force and to the community was sent up Three Mile to go door-to-door with the evacuation order, Wilson recalled. Just as the officer left the last house, a tire blew out on his squad car. He could see the fire crest the hill. He radioed in asking what to do. Wilson advised him to imagine he was on a race car pit crew. “He changed the tire in world record time, and got off the mountain,” Wilson said. Authorities had already closed I-70 in both directions, only allowing traffic from Glenwood Springs to head east toward Eagle. For a time, it looked like Highway 82 might have to be closed as well, cutting off a major evacuation route. As the flames were bearing down on the Red Mountain neighborhood, an all-city evacuation became a possibility. “We literally were looking at a plan to dump the entire town. The city manager’s jaw just about dropped to the floor on that one,” Wilson said. In the end, the evacuations were limited to West Glenwood, the Red Mountain neighborhood and the Four Mile area. In the days and weeks to come, as the city and its residents assessed the damage, cleaned up and dealt with the aftermath of mudslides, the community came together in a remarkable way. 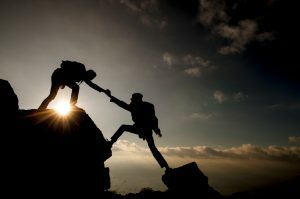 All over town, the phrase “How can I help?” was spoken hundreds of times. 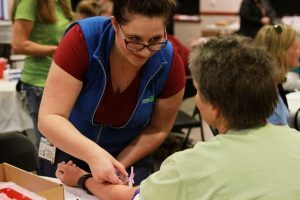 The community spirit of Glenwood Springs, along with the support of its neighbors throughout the region, came shining through the smoke, ash and mud.